I’m having playback issue when a song is pre-loaded in a setlist. Playing, some notes are just out of sync, delayed, I mean not following my fingers, something like (to make it clearer) off quantized. The same song loaded as single session doesn’t give any problem, all notes play correctly as played. Any idea why it happens? PS: with the pre-loaded setlist my laptop’s memory reaches 53%, so don’t think it’s a RAM issue. I can’t think of any reason or mechanism by which pre-loading a setlist would cause note latency/delay/jitter - especially if you’re not getting audio dropouts (since the MIDI processing is integrated with audio processing and a stall in audio processing is the only way MIDI could also be stalled). Does this happen with just one plugin? How much out of sync is it? From the folder opened in step 3, open the file “log.txt” in a text editor. You should see log entries for both the incoming MIDI events and the MIDI events hitting the plugin. From the time stamps you should be able to determine how much latency and compare it to when set list preload is turned off. Hi @brad believe it or not, it’s what it happens. I followed your diagnostic process suggestion but it’s quite heavy to get the timing, it’s a long list of notes and don’t know how you mean to compare them since I’m playing them, there is not a reference time to compare to. So, please can you investigate somehow? Thanks. I mean generate one log file when the problem is happening (preload on) and another when it’s not (preload off) and see if the time deltas between notes arriving at MIDI in and hitting the plugin are different. The first step would be to do the above comparison. If you can send me two log files, one where the problem is happening and one where it’s not I’ll check it out for you. Thanks for sending this through. I’ve looked at the logs and the timings between the two look almost identical. To explain, here’s what I’ve found. Firstly, you’re running and audio cycle of 512 samples at 48Khz - so each audio cycle is about 10milliseconds. Also note that because of the logging the times logged will actually be a little slower than when logging is disabled - ie: the logging will be making this worse than normal, but it still all looks OK to me. The rest of the line is what happened. This is all as expected when using a 10 millisecond audio cycle. Scrolling through both log files all events are averaging about 3-10 milliseconds between Cantabile receiving the event and it getting passed to the plugin. All that’s to say, as best I can tell Cantabile’s audio/MIDI processing pipeline is working as expected. My next suspicion would be something about the plugin is not rendering notes as quickly as possible. That would seem very odd to me and I can’t think of a reasonable explanation off hand, but to eliminate this as a possibility - does this only happen with PianoTeq or does it happen with other plugins too? 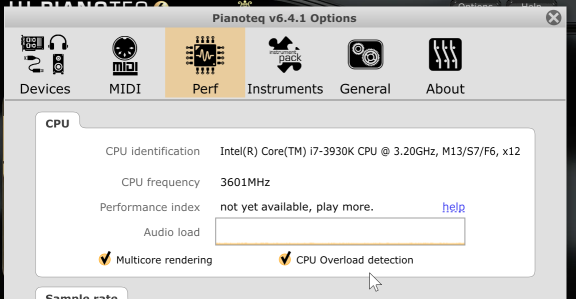 I know PianoTeq has a CPU Overload Protection option - perhaps try turning that off? Also, I’d try turning off either PianoTeq’s multi-core rendering or Cantabile’s multi-core support, they might be fighting against each other. Finally, it’s interesting that this only happens when pre-loaded set list is enabled. Do you have other instances of PianoTeq in other songs/racks? Perhaps this is an issue with PianoTeq when multiple instances are loaded (even if only one is currently activated).